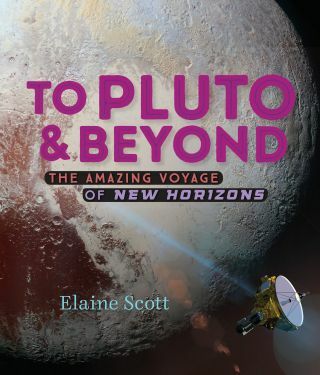 "To Pluto & Beyond: The Amazing Voyage of New Horizons" by Elaine Scott is a children's book that breaks down the incredible journey of NASA's New Horizons spacecraft to Pluto. One new children's book takes readers on a journey to Pluto with NASA's New Horizons spacecraft. "To Pluto & Beyond: The Amazing Voyage of New Horizons" is the epic tale of one spacecraft's journey from Earth to Pluto. In an earlier book, author Elaine Scott discussed Pluto's infamous reclassification in "When Is a Planet Not a Planet?" Now, she details the history and future of NASA's New Horizons mission and our changing relationship with Pluto on a level that even young children can understand. Women make up about 25 percent of the New Horizons flyby team. Scott wanted to highlight the contributions that women made to the mission in her book. Scott told Space.com that this book was partially inspired by Pluto's reclassificationand how much kids were affected by the change: "It really broke their little hearts when the planet was demoted," Scott said. Scott also said that she wants children, especially young girls who might be lacking encouragement or support, to be inspired by the mission and all of the science that goes into it. Scott's book is unique because it explores the intricate details of a complex NASA mission but is suitable for young children. Scott bridged this gap between technical mission details and something that children would actually be excited to read by speaking extensively with the scientists and staff who made the New Horizons mission possible. Among that number was Alan Stern, principal investigator of the New Horizons mission. By conducting interviews and speaking with the mission staff, Scott was able to frame the mission information in a way that makes sense to the book's young audience. Right before New Horizons first communicated after reaching Pluto (top). Right after the signal arrived to Earth, the whole room erupted in cheering and excitement (bottom). Because Scott doesn’t come from a scientific background, she feels that she can more easily anticipate the types of questions that kids might have about the mission and how to break down the information so that it's easy for them to understand. "I try to put it in their language," Scott said. This book aims to teach kids as young as 8 about the New Horizons mission, Pluto, and why it is so incredible and exciting that we're able to explore so far out into the solar system. The book also includes stunning images taken by the spacecraft and photos of the New Horizons mission team, science team, engineers and more. These visuals showcase the beauty that New Horizons has captured and all of the hard work that continues to go into the mission. Scott hopes that, even if the kids reading her book aren't "going to be rocket scientists, I want them to come away with the enormity and complexity of the universe that we live in."